From the Hancock County Courthouse, go west on Hwy 22 for 0.2 mile. Turn right on Dixie Road. Go 1 mile. Turn left on Lake Shore Road (old Pumping Station Road) and proceed 7.8 miles to the "T" intersection with Warren Chapel Road. (Note: this "T" intersection with Pumping Station/Lake Shore Road has Warren Chapel Road to the left and Harper Cemetery Road / Rives Rd. / Crestline Dr. to the right). Turn right and go 2.4 miles on Harper Cemetery Road. 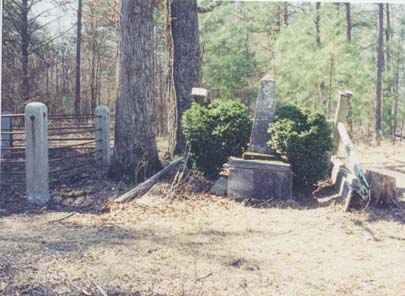 The cemetery is on a slight hill on the left, about 100 feet from the road. d/o W. J. and E. Harper. w/o Samuel Walker. The obelisk has a "cabbage rose" engraved in it. 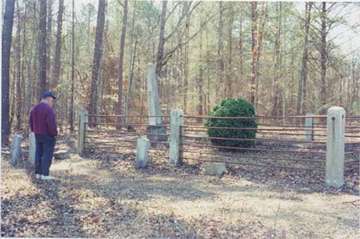 Monument is tipped over in 2000.
w/o G. W. Burton, M.D. "She died in the belief that she was going to rest with her Heavenly Father. Beloved in life; regretted in death." Died in her 20th year. Co. H 4th Ga. Inf. 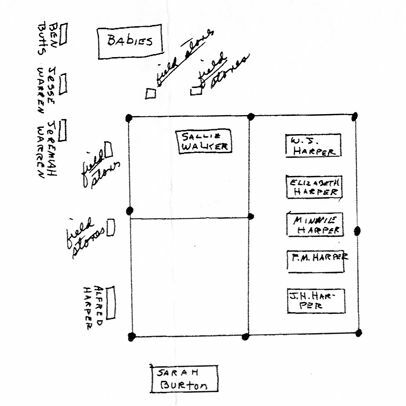 A brick enclosed area may be the grave site of unmarked babies.